WrestleMania is coming up very soon and Finn Balor is currently without a match, but that won’t stop WWE from promoting him as appearing. The interesting part is that Balor is appearing as The Demon in all of WWE’s promotional material for the show. The main page for the WWE Network shows Balor as The Demon and WWE was said to be irritated about that leaking out before it was announced. This did not stop WWE from continuing with the promotion either as Balor appeared on a train in New Jersey as the Demon King. 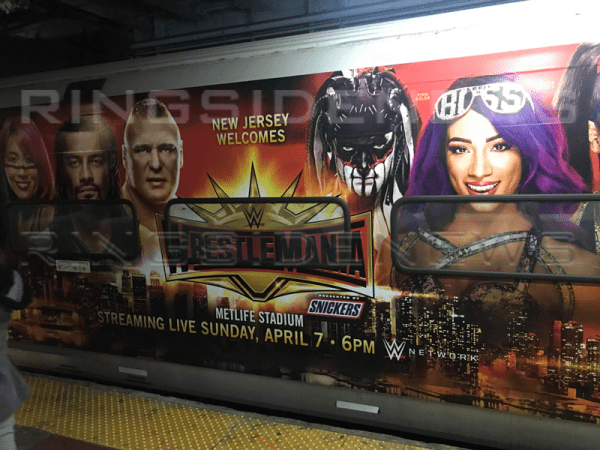 We previously reported that WWE is doing up NJ trains for Mania. This is yet another design they are using. It is very interesting to note that Balor appears as The Demon here. We will have to wait and see if Balor will return as the Demon before WrestleMania. If he appears tonight on Raw and gets booked in a match it will probably be a safe bet that he will be appearing at the show of shows as the Demon King.